Created by a Deaf BSL user, BSL Online’s mission is to enable everyone to learn British Sign Language and to promote understanding of Deaf issues and culture and of this rich and valuable language. Hi, My name is Dominic Caswell, and I work with my team – the BSL elves – to provide the best (in our opinion at least) online learning for British Sign Language. BSL Online was founded to enable anyone in the UK to learn British Sign Language in a friendly and engaging way, regardless of their access to adult education. 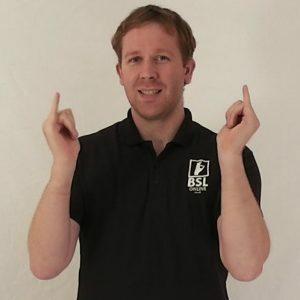 Teaching BSL is a passion of mine, from sharing useful signs with hearing friends to formal teaching of BSL to both hearing and Deaf young and adult learners to Signature level 2 standard, however I know that many people cannot attend BSL classes or have difficulty in finding ways to support their BSL learning. By using videos and interactive quizzes the BSL elves and I have built a website which allows learners to access resources at any time of day or night and to learn at their own pace. In founding and running the company I have been lucky enough to have the support of the wonderful BSL elves; educators, technical experts and signers & interpreters. The success of BSL online is due to their amazing efforts and skills (and the recuperative power of tea and biscuits). I am very proud of what we have achieved together and the improvements which we have made since BSL Online first came online.